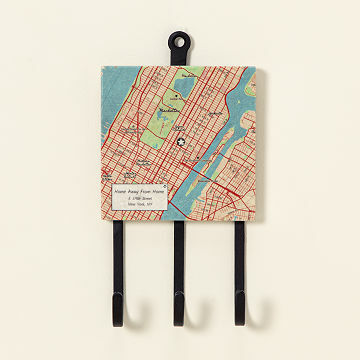 Celebrate your hometown or old stomping grounds every time you hang something on this vintage map rack. Celebrate your hometown, old stomping grounds, or newest neighborhood every time you hang something on this custom wall rack. Your chosen home base is marked by a star, surrounded by three square miles drawn from vintage, manually surveyed maps. The customized marble tile is mounted on a cast iron frame with three hooks for hanging keys, hand towels, dog leashes, or anything that could use a home of its own. Personalize the legend in the corner with the name and address of your special spot. It makes a great housewarming or hostess gift for anyone who loves a particular locale. Made in Providence, Rhode Island. Loved this! It's even nicer than I thought when I ordered it. The map has a bit of an old-school feel and the etching/colors are light but attractive. High-quality personalization blends right in. It's a heavier block, feels like marble. Hooks are strong, very well-constructed. It's on the smaller side, but doesn't detract from the piece. Thanks! My boyfriend uses it as a key holder. He used double sided tape in addition to a hook to keep it from moving when keys are placed on it. It is a great personalized gift! It was a great personalized gift for a family/friend that shows their love of their special location. This is beautiful, appears as expected, and built sturdy. Gifts for Christmas - not for myself - although, I would order one for myself. Placing it by our back door near our garage. Great idea....love, love, love it. First one I ordered was well constructed but had the wrong information. Reordered it. In the mean time ordered one for my husband and it arrived perfectly. Then the one I reordered arrived broken so I once again reordered it. Finally I got it right. Now I have ordered one more. We will see. This is a great idea and worked well as a novelty housewarming gift. Would have been really nice if it was a little bit bigger so it could be used for more than just decoration or a key rack.